House Speaker Paul Ryan held a so-called town hall-style meeting in his district Thursday. But, the public wasn’t invited. Instead, Ryan presided over what his office dubbed a “business” town hall, at an Oak Creek manufacturer. Ryan addressed employees’ questions on a wide range of issues. Ryan is squeezing in a couple of stops in his southeastern Wisconsin district before Congress returns to work next week. 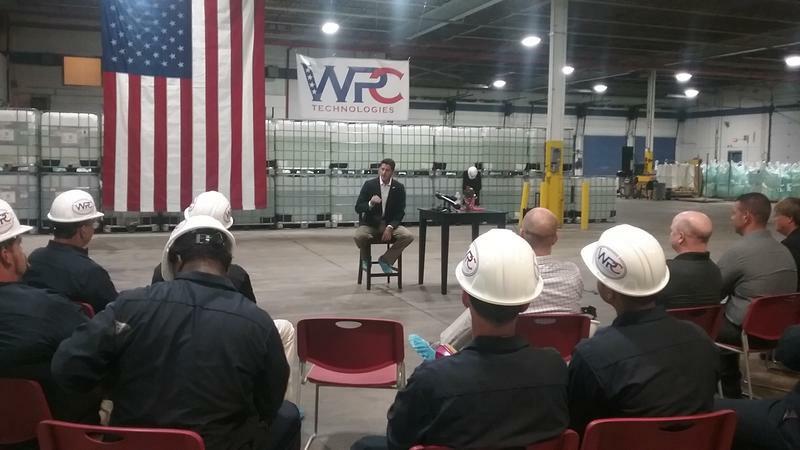 On Thursday, the House Speaker visited Oak Creek manufacturer WPC Technologies. It makes an anti-corrosive ingredient used to coat metal products. After a tour, Ryan met with about 25 employees; a company official compiled and read their questions. One was about unfolding events in North Korea. Ryan addressed the country’s efforts to test a long-range missile that could reach the U.S. He called it his current “number one" foreign policy concern. “That’s something that we cannot accept as a nation, if we want to preserve our own safety. This is not a regime that you want to see in possession of nuclear weapons because one, they could use it themselves and number two, and they’ve claimed they want to do this, they could proliferate. They could sell it to somebody who will use it,” Ryan says. Ryan says he wants Chinese leaders to work with the U.S. to help alleviate the potential threat. Another employee's question hit closer to home for the Oak Creek company. It asked Ryan what he thinks American manufacturing will look like in ten years. Ryan says he expects the sector to flourish, because of a tax reform package he hopes Congress passes this year. “We are taxing American manufacturers in many cases at double the tax rate our foreign competitors are taxing theirs, and that makes us really uncompetitive. So, one of the reasons we are doing tax reform this year is not just to have more jobs for economic growth but to put American businesses and manufacturers on a competitive scale globally,” Ryan says. “We think it’s stunning that Paul Ryan is holding these closed town hall meetings where average constituents can’t go and is not talking about the big issue on people’s minds and that is the health care plan that he crafted that will force 23 million people off coverage and we’ll return to the bad old days when there was discrimination based on pre-existing conditions,” Kraig says. Kraig says to give Ryan’s constituents a chance to weigh-in on health care, Citizen Action is sponsoring what it's calling an open town hall meeting on Saturday, in Ryan’s district. Although the Republican House Speaker won’t be there to hear citizens’ concerns, another congressman will. Democrat Mark Pocan of Dane County plans to attend -- and take their questions.